A city council vote to continue controversial police training programs was met with community outrage. A man bleeds from a wound on his head after being struck by a police baton. 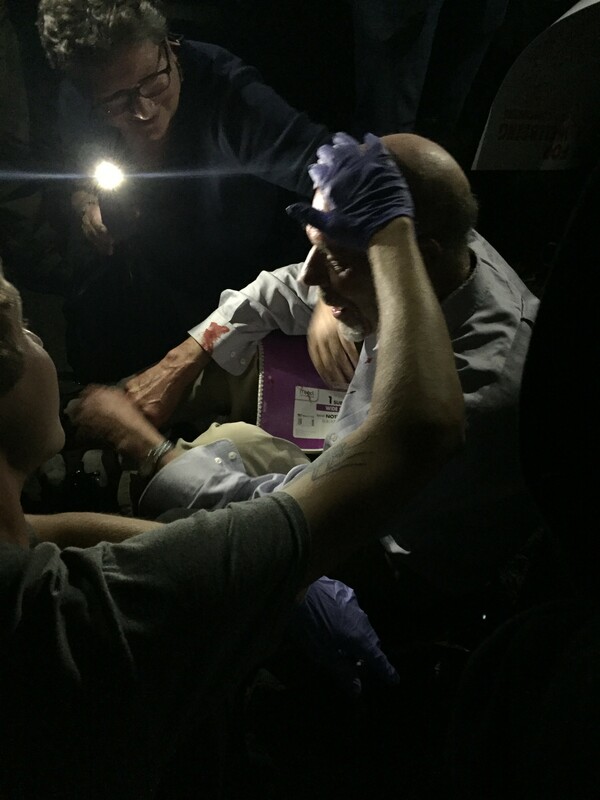 Last night’s Berkeley city council meeting ended with protests, two arrests — and one bloodied face. The incidents followed a contentious vote to purchase an armored vehicle and to continue participation in Urban Shield police-training activities. 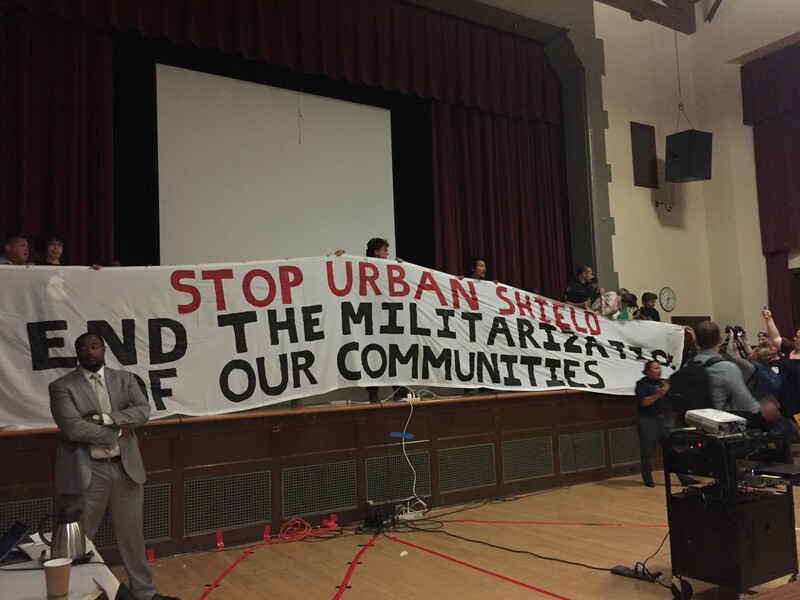 Community members, varying from military veterans to human-rights advocates and mental health professionals, called for the council to vote to pull out of Urban Shield during public comment that lasted for more than four hours. Urban Shield is a one-weekend training program that emphasizes role play and hypothetical scenarios to train officers for emergency-response situations. The program is designed for officers who work in high-threat, high-density urban areas. Many of those against Urban Shield cited fears of increased police militarization, and argued that the program turns the community into the enemy of the police. They also said racial profiling by the police was an additional concern. Former Berkeley Mayor Gus Newport also condemned Urban Shield, criticizing Mayor Jesse Arreguin and city leaders to argue that, under the “Trump regime,” resources should be put toward different investments, such as mental health programs. According to Berkeley Police Chief Andrew Greenwood, the department has been training officers through Urban Shield for 10 years, sending eight different officers annually. He said that the training is the reason why injuries or deaths during police deployments over the last 10 years have been extremely rare. “We reinforce our values by seeing how the scenarios play out,” Greenwood said. Councilmembers Kate Harrison and Cheryl Davila voted against Urban Shield, citing community concerns as well as issues with the program’s trade show, where weapons and other equipment are sold. Davila showed a picture of a T-shirt that read “Black Rifles Matter,” which was sold during an Urban Shield trade show in 2015. As an alternative, many community members suggested working with police and members of the community to develop new emergency response methods, working with outside programs such as the American Red Cross, or creating a community-policing effort. Some councilmembers stated that the training exercises were important, however, and that more information was needed on Urban Shield before pulling out completely. Councilmember Ben Bartlett, who voted in support, said during the meeting that his views on the need for anti-terrorism training were “radically altered” after witnessing far-right extremist rallies in Berkeley earlier this year. After nearly six hours, council voted to remain in Urban Shield, with a 6-2 vote, until September, after which a subcommittee will be formed to evaluate and report back with findings within six months. Before Councilmember Kriss Worthington could voice his abstention vote, though, protesters from the Stop Urban Shield Coalition overtook a microphone and announced that they would make a “no confidence” vote. Protesters then swarmed the dais, and during the ensuing chaos two protesters were arrested. Protesters surround the dais as the council votes to continue with Urban Shield training programs. Later, activists moved into the street. Police attempted to control the large crowd with batons, and one man was hit in the head. Afterward, blood trickled down his face as people attended to him. City council also voted 7-2 to purchase an armored vehicle, which BPD Sgt. Spencer Fomby described as a standard white van with bulletproof armor inside the walls. This, he explained, would be used as a way to safely transport both officers and civilians, and contains no weapons or gun turrets. The mayor proposed an amendment to the conditions around purchasing the armored vehicle, asking to clearly define what situations the armored vehicle would be used. Those situations, he said, would not include events or public demonstrations. The council also voted 5-4 to continue working with the Northern California Regional Intelligence Center, or NCRIC, a program that shares criminal data between local and federal agencies. Several councilmembers expressed concerns about the type of criminal activity Berkeley police are obligated to report to NCRIC, with Arreguin stating that he was ready to pull out of NCRIC altogether. Ultimately, city leaders voted to hold making a decision for a year, during which a subcommittee would be formed to evaluate the amount of federal access to the city’s crime database and other NCRIC activity. After the meeting, as community members and police filtered out, members of the the Stop Urban Shield Coalition gathered to plan their next move. Davila, the only council member who stayed with activists when the protests began, said she was disappointed by the vote and condemned the police’s response to the protesters. "I’m still waiting for a full report from the Berkeley Police Department about the disturbances following the Urban Shield meeting Tuesday...The officers gave people multiple verbal warnings and asked them to get off the stage. When they did not, they arrested two people inside the auditorium on charges of obstructing, delaying or resisting an officer, and for the obstruction of a Council Meeting. Both were cited and released...I don’t know why a person was hit with a baton and police are investigating the incident. I wish them a speedy recovery. I am eager to get more detail on the incident from police and will update residents as soon as I hear."